Narrow single platform trolley with twin handles. 6 wheel stock platform trolleys are perfect for transporting stock around a busy store, produce market, factory or warehouse. 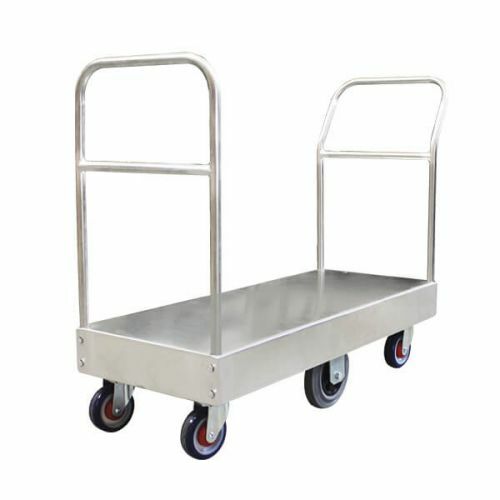 These galvanised platform trolleys feature an innovative 6 wheel rocking design that keeps the centre wheel grounded at all times allowing for full 360 degree movement around tight spaces. Rubber Tyred Nylon Centred wheels stay on the ground at all times during transport. When tilting the trolley shifts onto the outer shock-absorbing Rebound Rubber wheels.